Figs have a short season, which comes with an urgency to use them in every possible way. Because they must ripen on the tree, fresh figs are delicate and highly perishable, so use them as soon as you can. This unique salsa comes together quickly and goes with almost everything. Spread it on a sandwich, serve it with crackers and cheese, or use it as a sauce for grilled chicken, pork, and fish. Trim the stem end from the figs. Cut the figs into quarters lengthwise, then cut crosswise into ¼-inch pieces. Peel the cucumber, if desired, and trim the ends; cut the cucumber in half lengthwise. Cut the halves lengthwise into ¼-inch-thick slices, then crosswise into enough ¼-inch pieces to measure 1 cup. Peel and finely chop enough onion to measure ⅓ cup. If using the serrano, remove the stem, ribs, and seeds; finely chop as much of the serrano as you like. Wash your hands after handling. 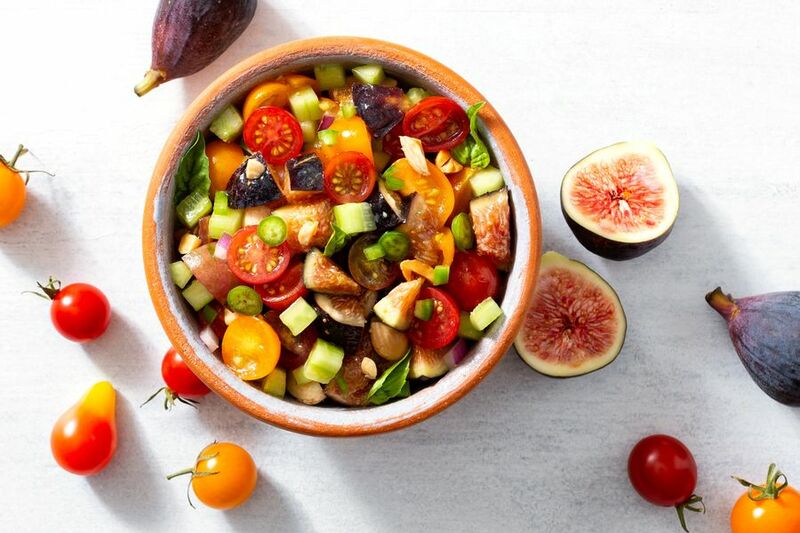 In a large bowl, toss together the figs, cucumber, tomatoes, onion, serrano, basil, almonds, olive oil, and lime juice. Season to taste with salt and pepper and add as many chile flakes as you like. If using immediately, serve the salsa as desired, or cover and refrigerate for up to 2 days. Nutrition per serving: Calories: 140, Protein: 2g (4% DV), Fiber: 4g (16% DV), Total Fat: 8g (12% DV), Monounsaturated Fat: 4.5g, Polyunsaturated Fat: 0.5g, Saturated Fat: 1g (5% DV), Cholesterol: 0mg (0% DV), Sodium: 50mg (2% DV), Carbohydrates: 17g (6% DV), Total Sugars: 13g, Added Sugars: 0g (0% DV). Not a significant source of trans fat.